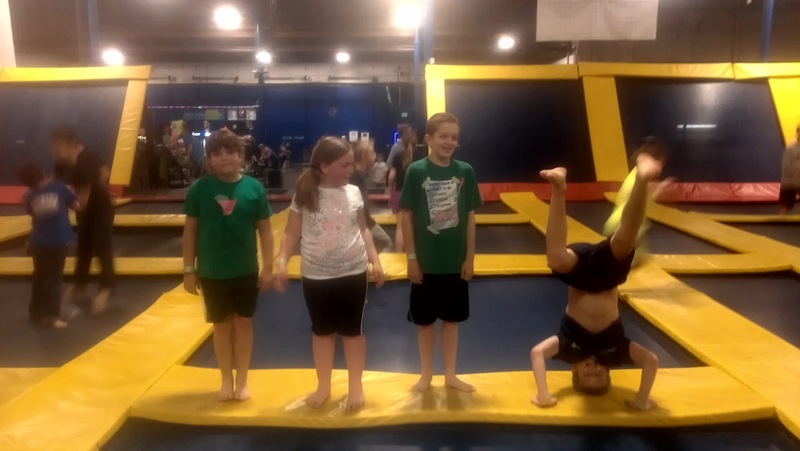 Being Frugal and Making It Work: Sky High Sports Indoor Trampoline Fun Center: Spokane - Let Your Kids Bounce Off the Walls! Sky High Sports Indoor Trampoline Fun Center: Spokane - Let Your Kids Bounce Off the Walls! My kids are on Spring Break this week so finding fun things to keep them busy is at the top of my priority list. Yesterday we decided to go somewhere that we had never gone before... Sky High Sports! We had seen commercials on t.v., heard about it from friends and looked at photos and videos on Facebook. The kids had asked several times in the past to go, but things just never worked out... until this week! There were 6 of us in our "party," my son and one of his friends, my daughter, her best friend, her mom and myself! When we arrived we had to check-in with our basic information (name, DOB, address) on their computer since we were first time jumpers. We then moved to the front desk where you pay and sign the liability waivers. The entire process was quick and easy, and the staff was very friendly. The front lobby area is very large and inviting with couches, tables and chairs, arcade games, vending machines, bathrooms, water fountains, and the Sky High Cafe. 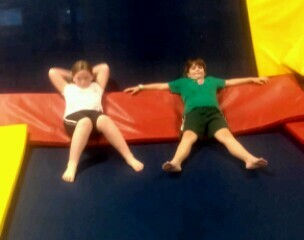 When the kids saw the main trampoline area their eyes got so big and they couldn't get out there fast enough! After about 20 minutes of jumping, flipping, laughing and bouncing off the walls... literally, we decided to explore and see what else there was to do. There are four other trampoline areas: one was for dodgeball, one was for kids 8 and under, another was the foam pit and the last one was closed while we were there. There were also a few other areas with tables, comfy couches and televisions for people to sit and relax. From the main court area and the foam pits... back and forth, back and forth... the kids were going non-stop for 1 1/2 hours before they realized they were thirsty, hungry and exhausted! The moms had already taken several breaks in the action and just enjoyed watching the kids have so much fun! Sky High Sports also offers AIRobics, Trampoline Dodgeball, Foam Pits, Birthday Parties, Group Events, Corporate Events, Fundraising Opportunities, Trampoline Walls and Floors! WHAT IS SKY HIGH SPORTS? "Sky High Sports is a unique trampoline fun center. This facility has been designed and created for one purpose: To have FUN! Come and improvise! Whether you flip forward or flip backward, you will definitely flip out for Sky High Sports! You can free-bounce and do tricks all day, or you can join us for some of our organized activities, like our trampoline dodgeball. As long as you like to bounce, Sky High Sports is for you. Everyone is welcome. Come by for an hour or two and have some fun. Unlike home trampolines, with our specially designed, spring loaded frame, landing here has more give. All frames and springs are covered by 2 inch thick safety pads. With 360 degrees of trampoline walls and court supervisors, there's no falling off this trampoline." Have you ever been to a Sky High Sports? Disclaimer: I received complimentary free jump time from Sky High Sports Spokane for the purpose of writing a review. Regardless, I only recommend products or services I use personally and/or believe will be a good fit for my readers. The views and opinions expressed on this blog are purely my own. Results may vary. No monetary compensation was received. This sounds like such a FUN place to go! My son needs a place like this to burn off some energy! We have one of these here! Such a fun place! We haven't been yet, but I've heard it's super fun! I'd nearly be willing to fly there just to go there! Gosh, my children would have a blast there. Sounds like a fun and HEALTHY activity for the whole family!!! sounds like a blast would love to take my family. We love Sky High! 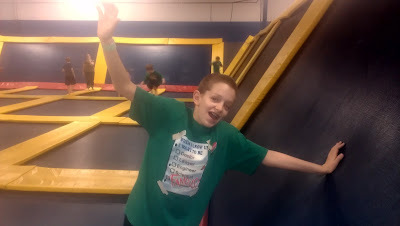 It's great for kiddos who have sensory needs and need to JUMP! I love that they have a special needs kids jump! My oldest has tried it ad it was great, there were fewer people and it wasn't as loud! Great review! I love how they have a room just for the kidlets. I would be concerned having them with adults and large (rowdy) kids. Did you find out what the other room was for? You probably never thought that jumping on a trampoline could have many benefits in your human body. You might only think about it as a simple toy meant only for recreation and enjoyment. So you can add this jumping and playing tool in your backyard. You can find best trampoline with the comprehensive trampoline reviews guide. Trampoline can be considered as one of best fitness equipment, so I have made up my mind to click here and get the best one for myself.